Title Text: It's actually worst in people who study the Dunning–Kruger effect. We tried to organize a conference on it, but the only people who would agree to give the keynote were random undergrads. I guess no-one else feels competent enough to post this. If I try, do you promise not to berate me for being so incompetent at it? And now Wikipedia gets a sudden uptick in hits for the article on the Dunning-Kruger effect. New User wrote: And now Wikipedia gets a sudden uptick in hits for the article on the Dunning-Kruger effect. Thanks, Randall, for ruining my whole morning's productivity! I came "this" close to watching cat videos! I wonder frequently whether I have imposter syndrome, or if I only wish I did because that would mean my insecurities are unfounded and everyone else thinks I’m more awesome than I think I am, which would be nice. I suspect you are deliberately underestimating your understanding of the Dunning-Kruger effect, out of an irrational fear of surveillance. You have Paranoid-Dunning-Kruger-impostor-effect-syndrome-by-proxy. I, of course, am an expert on understanding the meaning of the phrase "Dunning-Kruger effect". Or am I? I'm entirely confident that you are. Sorry. After reading through these posts, the Gell-Mann Amnesia Effect makes me think you're all experts! 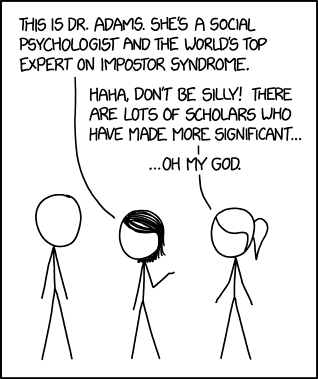 Pfhorrest wrote: I wonder frequently whether I have imposter syndrome, or if I only wish I did because that would mean my insecurities are unfounded and everyone else thinks I’m more awesome than I think I am, which would be nice. It is hard to say without knowing what you and the other forumites think, but if you have to wonder, I'd say the odds are pretty good.